Make your second draft a real revision, rather than an aimless tinkering. Keep you from succumbing to despair as you flail about in the dark forest of writerly self-doubt. By this point, I’ve written a first draft, identified my central theme, and used colored dots to track the character arcs and motifs in each scene in the manuscript. Now the dots get converted into a spreadsheet on your computer. This is where things start to get super geeky. The spreadsheet is color coded to match the dots in my manuscript, and it allows me to see what each scene does to drive the story forward. Now I have a clear sense of the flow of my story, in a format that allows me to sort things and move them around as needed. 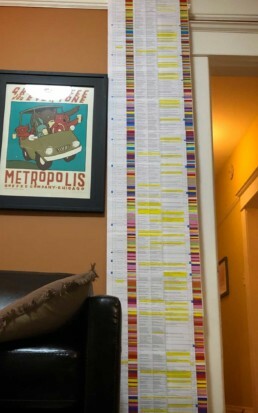 When I’m done with The Chart, I print it out and hang it up so I can look up and see – just by tracking the color changes – what story lines have drifted out of the book for too long, and what arcs/motifs dominate the plot. This helps me immensely, because scrolling up and down on a computer screen brings a quick end to all rational thought. If you can track 487 rows of cells on a single screen, then good for you. For me, the chart is crucial for getting a feel for my plot. I spend a lot of time staring at that first iteration of The Chart. My wife tells me I’m just spacing out, but in fact I’m thinking about individual characters, deciding on their relative importance to the theme, and deciding their fate. After a good amount of musing on the story, I create a brief character sketch for each person in the book, based on my new understanding of how that character drives the plot. For what it’s worth, I do this in a notebook, using a pencil. I’m a big fan of avoiding staring at screens all the damn time. Armed with my central theme and my character sketches, I attach The Chart to a couple of dowels to create The Scroll. I lay the scroll on the floor (because it’s too damn long to fit on a desk) and add hand written notes about each character, tracking one character at a time through the whole Scroll. The key here is starting with my most important characters, and working my way to the minor characters. This takes a lot of time. It’s physically uncomfortable. It inspires mockery from my sons and concern from my wife, as they watch me slide around on the hardwoods, clutching several colors of ballpoint pen and highlighter. Their derision and doubt only make me stronger. After plugging a character’s notes into The Scroll, I return to the computer, and convert the handwritten ideas into a revised version of The Chart. Once all that is done, I have a clear outline for my second draft. I also have a sore back and bruised elbows from all that time scrabbling around on the floor. Everything that goes into the second draft comes from The Chart, and everything on The Chart is there for a reason. I don’t ignore great ideas that pop up, and I’m still willing to make major changes to the story, but I’m working from a plan. And as I used to say when I was an expedition leader, It’s good to have a plan; it gives you something from which to digress. Your second draft is now ready for writing groups and beta readers. This is where you find out that what seemed like genius to you is just plain weird to other people. This is the point where you discover that the sullen teenager in chapter three pops up again in chapter nine as a darling toddler, Benjamin Button style. This is where you learn that the subplot featuring a sentient cucumber isn’t magical realism, it’s just stupid. That darling, and many others, must die. You wrote your first draft fearlessly. You used The Chart and The Scroll to identify your theme and organize your initial scribblings into a coherent narrative. You sought the advice of trusted readers. Now it’s time to bring it all together, and Edit Anxiously. It is time, brave writer friend, to worry about what other people think. Is the protagonist’s wacky college pal actually a racist asshat? Does the beloved husband actually come across like a mindless schlub in cargo shorts? Is the Wise Old Jell-O Salesman nothing more than a mouthpiece for your strident political opinions? Now is where you get to think about obsess about all that stuff. Going through this exercise for my books allows me to understand what I’m getting at. It makes it easy (?) to spin through the document and make sure all the right seeds are sewn in the early going. It also makes it obvious where characters disappear from the story for long periods.